We experience life through our nervous system. Simply put, if our nervous system doesn’t work right, we don’t work right. And when we don’t work right, we’re not healthy! 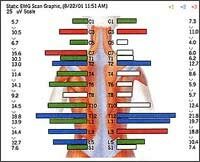 We use technology to measure the condition of your nervous system. It’s a noninvasive procedure called surface EMG. This noninvasive procedure “listens” to your nervous system like a high-tech stethoscope. The same part of your nervous system that controls your internal organs regulates the temperature of your skin. Our instrument measures differences as small as a tenth of a degree! Each color represents a different amount of nervous system disturbance.After gowning, we’ll have you sit still for a moment or two. Then, starting at the base of your skull, we’ll run two probes down your back. Think of these as radio antennas listening for a distant station. That’s it. The computer does the rest! You’ll see the computerized printout and learn what it means. Because your care is based on the condition of your nervous system, not how you feel, this technology is the focal point of our practice.